Life is a journey with undefined time to an unknown destination. Oftentimes, failure and disappointment is not fate nor destiny. It is the price for foolishness and stupidity. Be wise. Love is our true destiny. We do not find meaning of life by ourselves alone we find it with another. 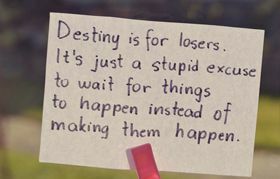 Destiny goes a long way in deciding what all will happen in your future. When hard work combines with favour from destiny too, you become a destiny's child. You eventually get rewarded since destiny is by your side. The moment when destiny is in our grip or hold, rarely comes in our lives. Such a moment should be utilised fully and you should make the most of it.